After all the madness in the marsh I would have been a fool not to take up my friends offer to join her in the Florida Keys. Jim tagged along too and before you know it we were sipping cocktails in a fancy little beach bar eating fresh grouper tacos. 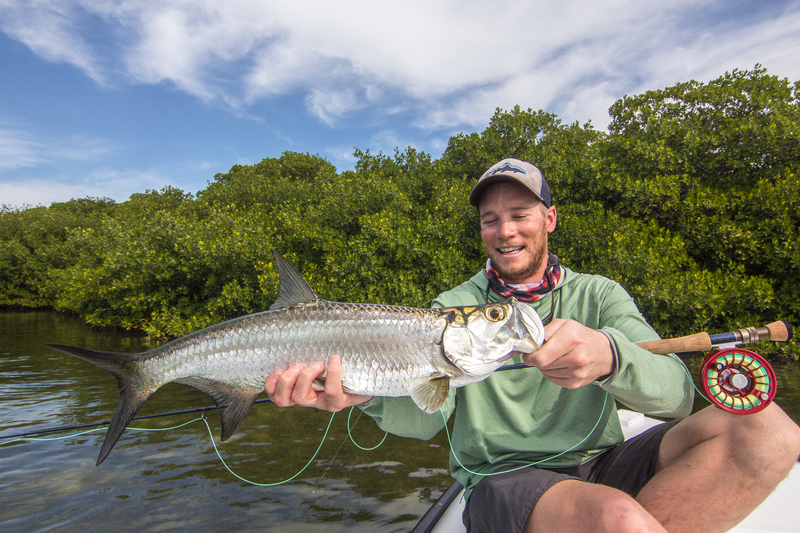 I had been to the keys only once before, chasing tarpon around the backcountry and also on the oceanside. I’ll never forget the daisy chains of 100 lb. tarpon cruising by the boat, oblivious to our presence. I couldn’t figure these fish out and apparently you have to force feed them into a grab as when they are on their migration, they are not eating much. Suzanne had it all lined up and even knew the right guides to fish with. We were lucky to spend the day in the boat with local legend Jared Raskob. Immediately I could tell Jared was a passionate guide who knew his boat, his fishery, and how to deal with people. 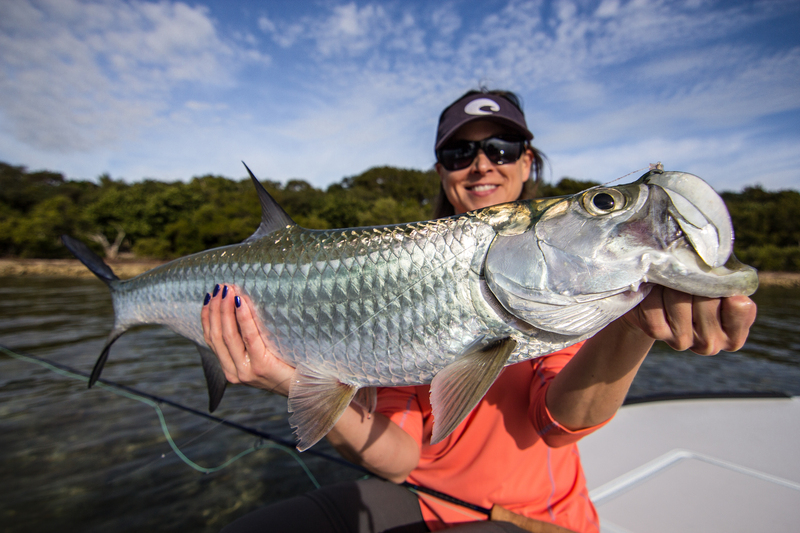 Suzanne and I felt right at home when Jared turned the music up on our ride out to an amazing piece of water, full of baby tarpon. I have to say I fell in love with the keys all over again and especially clear warm water. After spending the previous two weeks in Louisiana I thought these fish would be easy to see for sure. That was it for me and that was all I needed. Riding past these beautiful expansive flats all I could do was hope to see a tail, or some nervous water, I would have been OK just getting out to wade fish all day. Our very first stopping point was a neat lagoon nestled in some mangroves. It was so beautiful and I could see tarpon just hovering in the shadows. It was Suzanne’s turn so I stayed back and let Jared do his thing. He put Suzanne right on a small herd of tarpon and we even got one to eat but missed the hook set. It was only a few minutes later that she had her first ever tarpon to hand. Eventually it was my turn to fish and I wasn’t going to let my guide down. 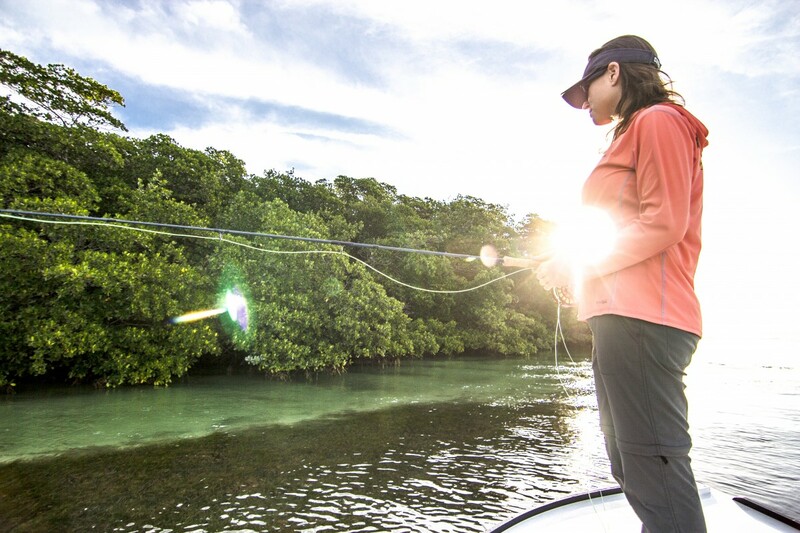 Jared sat up on his perch and pointed out a few tarpon in a hole in the mangroves. I have to say I was nervous at first when he started directing me but when I laid out my first cast I knew I had done this before and Jared knew too. I got lucky that moment when I saw a tarpon following my small cockroach fly. I kept stripping and eventually saw this beautiful fish eat my fly just yards away! Throughout the rest of the day I saw big snook, parrotfish in the mangroves, baby barracuda, boxfish, mangrove snapper, and numerous other beautiful flats species with a couple paddle boarders and jet skiers scattered about. I felt like grabbing the 12 weight and casting at a few of them but instead just gave them a wave and bit my tongue. Meanwhile I just landed in New Orleans to compete in the Sheepy fly fishing tournament. Stay tuned to see how things work out!